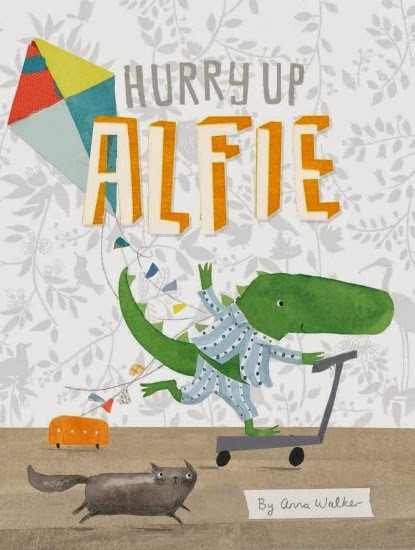 Hurry Up Alfie was written and illustrated by Anna Walker, and published by Scholastic Press, 2014. RRP: $Au19.99. Alfie’s in no hurry to get up ... until he finds out he’s going to the park! But getting ready is hard when you have so many other things to do! Parents will love this delightful children’s picture book. Anyone who’s tried to encourage an exuberant and independent-minded pre-schooler to get dressed and go somewhere will grin ruefully over Alfie’s antics. How often have we seen a child swinging from the door jamb and asked what he is doing, only to be answered cheerfully with “Nothing”?